By the time Williams retired in 1960 the man they called “The Splendid Splinter” had made himself a pretty decent claim on that title. Williams was born in San Diego in 1918 and grew up in Southern California city. He was taught baseball by one of his uncles, who had been a semi-pro player. He starred as a pitcher in high school and had an offer from the Yankees before he graduated. But his mother insisted he stay home and join the San Diego Padres, who were a minor league team at the time. After two years with the Padres as an outfielder (during which he graduated high school) he was sold to the Boston Red Sox. Williams made his Major League debut in 1939 as a 20 year old and finished the year fourth on the MVP ballot after hitting 327 with 31 home runs and 145 RBIs. In 1941 he became the last man to ever hit .400 when he finished the season at .406 and led the league with 37 home runs to boot. The next season Williams won the Triple Crown. Like most of the stars of his day, Williams was s drafted by the military and shipped off to fight in World War 2. Williams was commissioned as a second lieutenant in the United States Marine Core as a Naval Aviator. 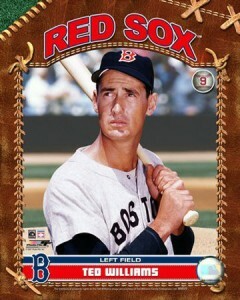 He spent three years in the military and when he returned in 1946 he hit .342 with 38 home runs and won his first MVP. The Red Sox reached the World Series in 1946, the only of Williams’ career, but Boston dropped the Fall Classic in seven games to the St. Louis Cardinals. Williams won another MVP in 1949 and by then had firmly establishes himself as baseball’s best hitter since Babe Ruth. In 1952 was recalled by the Navy and sent to fight in Korea. He flew 39 combat flights. Future astronaut John Glenn, who was in Williams’ squadron during the conflict, called Williams one the best pilots he’d ever seen. For his military career Williams won 12 medals and citations, including a prestigious Air Medal . Williams finished his career with 2654 hits, 521 home runs, 1839 RBIs, a .344 batting average and a 1116 OPS. If not for the almost five prime years he missed for military service, Williams would have surely surpassed Babe Ruth’s then-home run record of 660, and would probably accumulated more than 2297 RBIs, which is the current record set by Hank Aaron. He was inducted into the Hall of Fame in 1966 on his first year of eligibility. Williams managed the Washington Senators/Texas Rangers franchise between 1969 and 1972, winning the American League Manager the Year in ‘69. Ultimately he didn’t have the patience to be a manager and began focusing his talents on fly-fishing, establishing himself as one of the premier anglers in the world. In 2000, Williams was inducted into the Game Fishing Association Hall of Fame, joining Jim Brown and Carl Hubbard as the only American sporting figures elected to two different Hall of Fames. As a player, Williams had an antagonistic relationship with the press and could be prickly with the fans too. However in his retirement Williams became a much more likeable, almost-cuddly figure and loved talking about the science of hitting and generally promoting baseball. In his later life Williams raised millions of dollars for cancer research. In 1991 was awarded the Presidential Medal of Freedom. 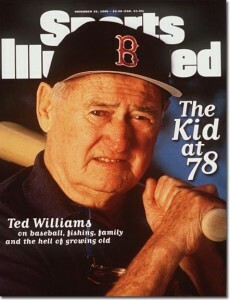 Ted Williams died in 2002 at the age of 83. A legal battle over his remains ensued, with two of his children saying he wished to be frozen cryogenically and a his third saying he wished to be cremated. 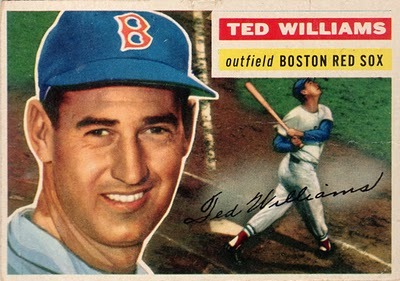 The cryogenic side won in court, and Ted Williams’ head and body were famously frozen and await future reanimation. So for all we know the folks in the Twenty-Second century and beyond will also witness the hitting greatness of Ted Williams (or cyborg Ted Williams) in person.